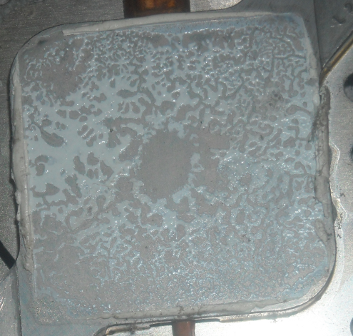 It is well understood that the most (65% ) common electronic failures arise from thermal cycling. Repeated thermal cycling and thermal shocks will, over a period of time, cause a mechanical break in one of the components or interconnects rendering the entire system inoperable. 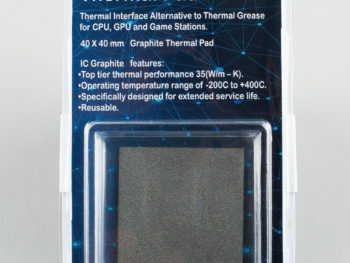 The importance of a computer’s thermal compound cannot be overstated and is the first line of defense against extreme thermal stress and failure. 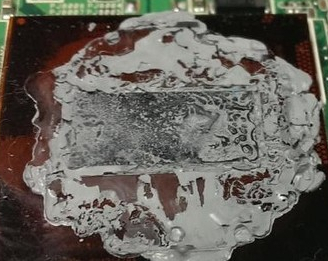 PlaystationTM heat sink thermal grease failure after only light use for a year. 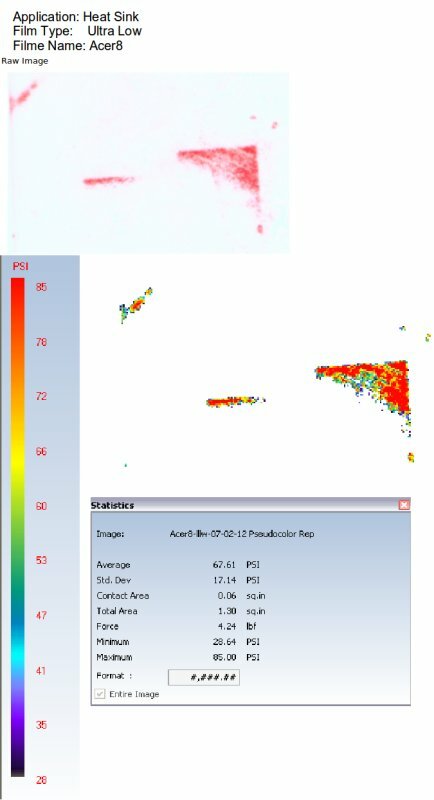 Photo shows loss of approximately 50% of useful thermal contact area. With IC Diamond you will never see this kind of failure. Typical examples of ‘pump out’ on the left and ‘bake out’ on the right. 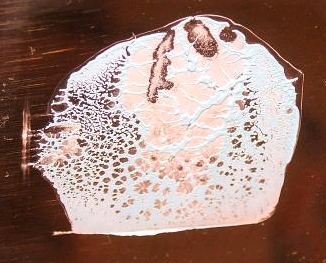 In both examples, the liquid in the Desktop Compound Failure compound has dissipated through thermal cycling or high thermal loads. The loss of liquid leaves holes or voids in the contact area which in turn increases temperatures and speeds up further loss of liquid. Note the one on the left failed here after only 400 hours cumulative run time. Many retail compounds sell on performance and a cheap shortcut to performance is to add excess liquid to the mix. The resulting creme-like mix spreads easily and has a low contact resistance for good thermal performance but unfortunately this decreases quality and long term reliability. 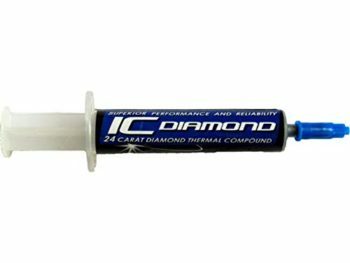 IC Diamond solves this type of common failure problem by incorporating only a couple percent of liquid in the paste. 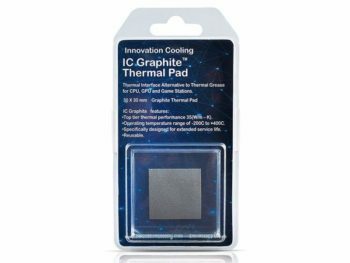 This simple concept is often specified by OEM's to increase reliability, OEM;s specs require that less than 10% liquid (inversely - bulk loading over 90%) be present in any thermal compound mix. This liquid restriction increases reliability by making it more difficult for the grease to "bake out" or "pump out". Diamond has the highest thermal conductivity of any material @ 2000-2500 W/m-K and maintains its superior performance across a range of conditions that would cause most compounds to fail. 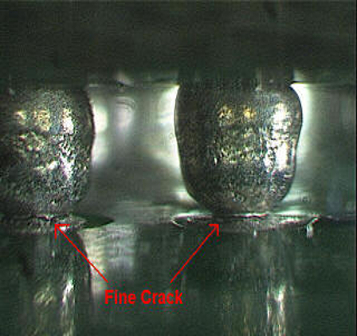 Pictured above is an accelerated test demonstration of IC Diamond’s durability. The Thermal compound test samples are sandwiched in between two 3X10 glass slides. Test result was run for 20 hours at 150C, the center test sample labeled ICD is IC Diamond, the others are top selling retail performance pastes. The competition compounds feature the formation of voids, and span the range of initial failure to complete failure. 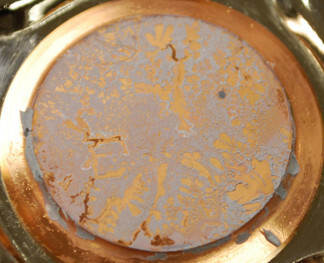 IC Diamond was observed to have no visible points of failure under these conditions. The picture is back lighted so the void formation is clearly visible. IC Diamond has been tested in a thermal cycling chamber – from -40 C to +85 C – for up to 250 cycles (with the copper block heated with 130 W of power (along with a fan heat sink) and found no change in thermal performance / thermal resistance of the grease. 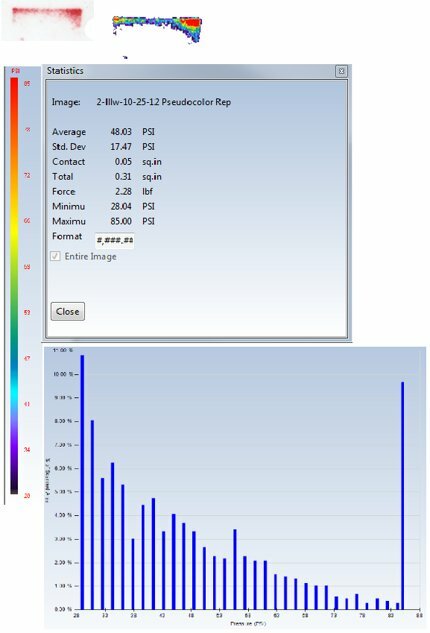 In another thermal test IC Diamond was placed in a thermal chamber for a continuous 1000 hrs @125 C with no change in thermal performance. In a separate test we pulled “full vacuum” on IC Diamond with a mechanical pump for ca. 65 hours at room temperature. The resulting … weight loss was almost immeasurable – 0.3 mg out of 6.2222 g. This works out to be 0.0048 wt %. Notebook compound initial failure only 4 months after application. Many retail compounds sell on performance and an easy shortcut to performance is to add excess liquid to the mix. 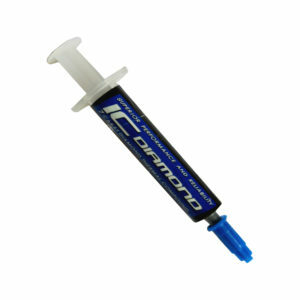 The resulting crème-like mix spreads easily and online pharmacy cheap meds, has a low contact resistance for good thermal performance but also has decreased long term reliability.. IC Diamond solves this type of common failure problem by incorporating only a couple % liquid with the simple concept as specified by OEM's to increase reliabilty is to use less than 10% in any thermal compound mix as it is harder to bake or pump out a solid. Diamond has the highest thermal conductivity of any material @ 2000-2500 W/m-K and maintains its superior performance across a range of conditions that would cause most compounds to fail. Data acquired from laptop endusers revealed an average of 10 degrees C higher temperature than your average overclocked desktop PC. so included here are some examples below as what you may encounter. 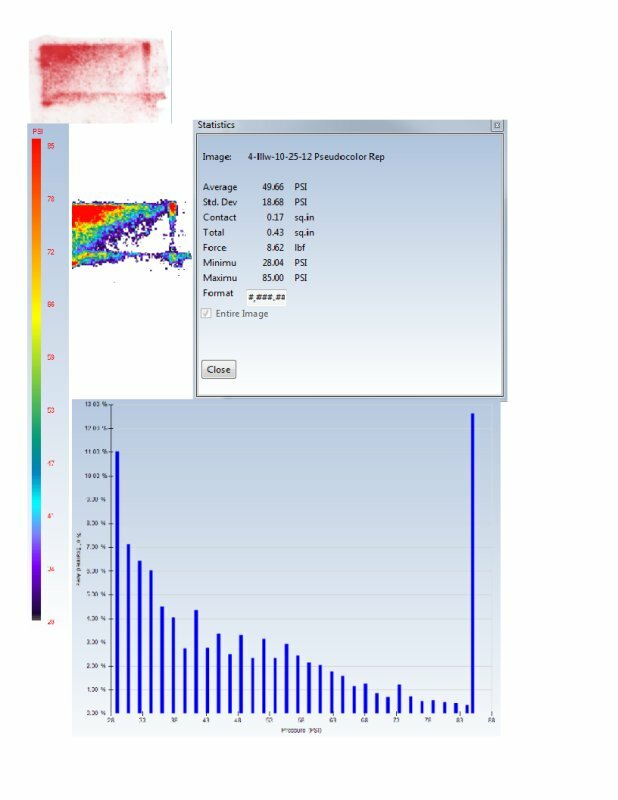 A closer examination with Fuji Pre-Scale contact and pressure film with subsequent data analysis demonstrated generally poor contact across the board which would significantly affect long term reliability. 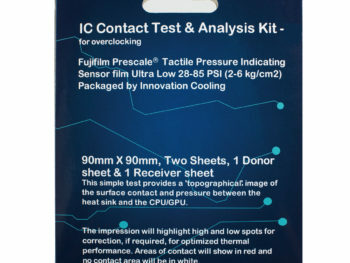 Heat transfer with this unequal contact distribution accelerates thermal compound failure requiring early replacement. 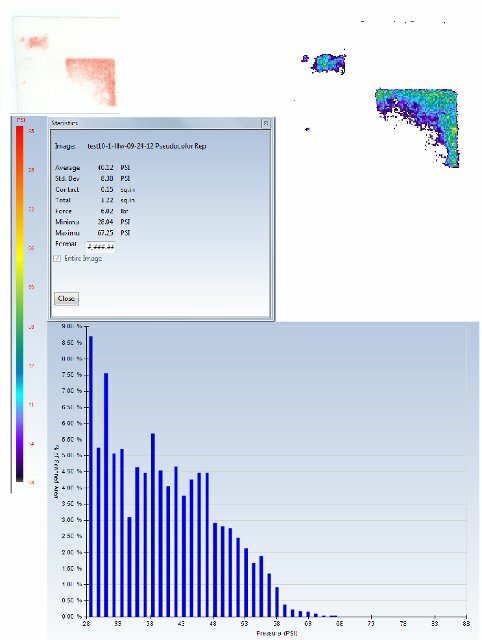 With the exception of the last example in the series this sample group all had poor contact. 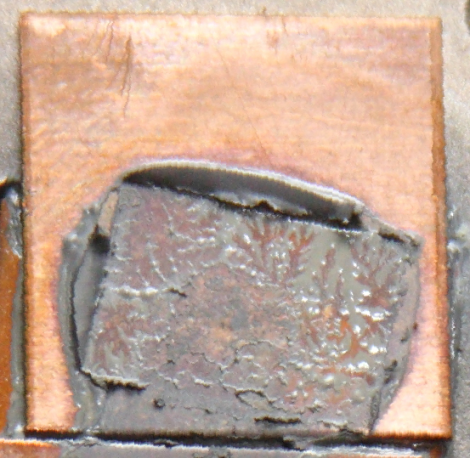 The very last picture in the group below Is a copper shim modification done by a end user to increase contact on a laptop CPU. The dissassebly with IC Diamond after 9 months can be seen to have good contact and pressure and appears as a fresh mount with the liquid appearance. Pictured above is an accelerated test demonstration of IC Diamond’s durability. The Thermal compound test samples are sandwiched in between two 3X10 glass slides. 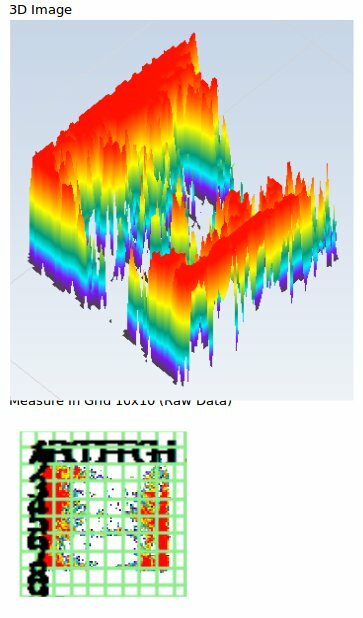 Test result was run for 20 hours at 150C, the center picture ICD is IC Diamond, the others are top selling retail performance pastes. The competition compounds feature the formation of voids, and span the range of initial failure to complete failure. IC Diamond was observed to have no visible points of failure under these conditions. The picture is back lighted so the void formation is clearly visible. 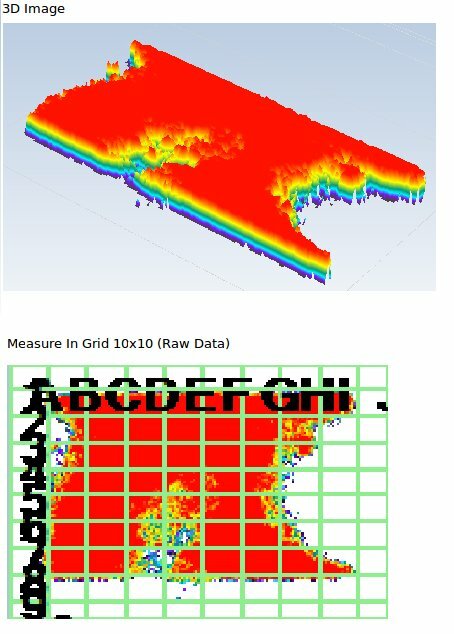 IC Diamond has been tested in a thermal cycling chamber - from -40 C to +85 C - for up to 250 cycles (with the copper block heated with 130 W of power (along with a fan heat sink) and found no change in thermal performance / thermal resistance of the grease. In a separate test we pulled "full vacuum" on IC Diamond with a mechanical pump for ca. 65 hours at room temperature. 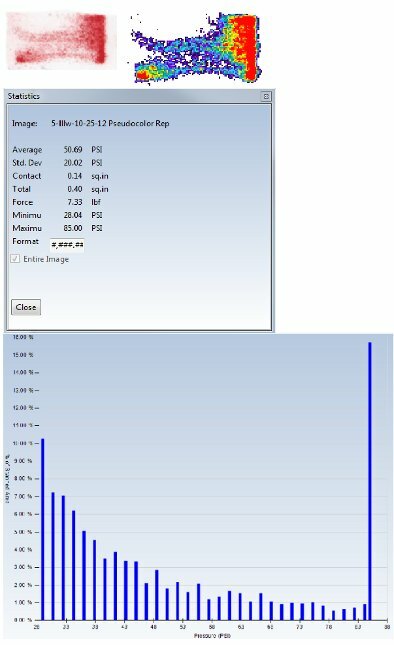 The resulting ... weight loss was almost immeasurable - 0.3 mg out of 6.2222 g. This works out to be 0.0048 wt %.